11. 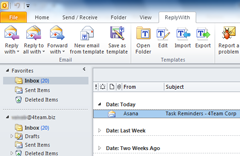 I cannot find ReplyWith Templates buttons and menus on my Outlook toolbar. Yes, you need to have Administrator rights to install ReplyWith Templates. 10.How do I update from the previous product version to a new one? Find 4Team Reply With Templates and Click Remove. ReplyWith Templates options to hide buttons and menus might have been selected. To view ReplyWith Templates buttons and menus, unselect the checkboxes in theReplyWith Templates - Optionsform.